Facebook timeline display your profile information in all new format. While many users do not like this format and want to disable Facebook timeline feature – Facebook is sticking to it and there is no likely-hood of reverting back to old format in future. Friends list is displayed prominently on your profile in new timeline format. For privacy reasons, few users may want hide friends list from timeline profile. Procedure to change settings for hiding friends list on Facebook profile in timeline format is straighforward. Once you make required change, friends lists is not displayed on your Facebook profile – when viewed by other Facebook users. 1. Once you login into your Facebook account, click on your profile name at top left to open dedicated page of your Facebook profile page in timeline format. 2. Then click See All button at top right of ‘Friends’ section. 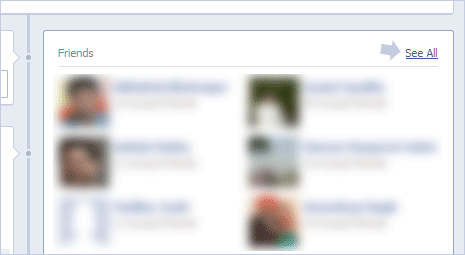 This will open page showing listing of your friends on Facebook. Now click on Edit button at the top and then click down arrow button. 3. Click to select ‘Only Me’ option from drop menu. You can also customize further by selecting custom, friends or public options. 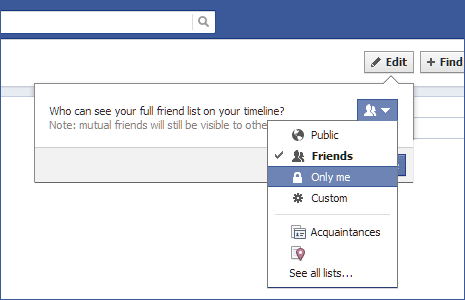 However, selecting ‘Only Me’ option is good enough to hide friend listing from others on Facebook. Note: mutual friends will still be visible to other people.